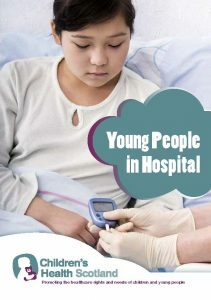 What happens when a young person goes to hospital? Why do I have to go in and do I have to stay? What things are there to do? What about rest and free time? Will I miss out on my education? How can I decide what’s best for me? There is also information on preparing for surgery and anaesthetics, young people’s health rights, useful links and helpful organisations. What will happen when my child has a stay in hospital? Families usually have a lot of questions when their child is having to go into hospital. Children’s Health Scotland’s guide, What to expect when a child goes to hospital answers the following questions which are often asked by families. What’s it like going into hospital? Will I be able to stay with my child in hospital? What happens if I can’t stay – can relatives or friends help? What happens on the ward? My child is having an operation – what should I tell them? What will happen on the day of the operation? What about going home and any follow up appointments? How can I help my child to get back to normal once they are home? It gives tips for a happier stay in hospital and lists helpful organisations. There are so many staff involved in my child’s care I am confused – who does what? Liaison Nurses are there to support you and your child with all things relating to the child’s condition and treatment. They can offer medical and practical advice and can signpost you to other helpful services, including financial and travel support. Parents should always ask if there is a specialist liaison nurse for their child’s service/condition. Contact a Family (CAF) has a guide Concerned about your child, which lists the various professionals who can help and sets out a description of their roles. Can I stay with my child overnight and if so where do I stay? European Association for Children in Hospital (EACH) Charter articles 2 and 3 state that children and young people have the right to have a parent or carer with them for support. Charter article 3 also states that parents and carers should be able to stay overnight to support their child. Children’s wards tend to have a parent bed beside the child’s bed. It is usually not possible for parents to sleep beside their child in an intensive care ward, but there may be a room for them to rest in. Sometimes parent accommodation is provided by the hospital or for example through Ronald McDonald houses. Different hospitals may have different arrangements. Please ask your child’s ward team or at your pre-admission visit. What if the hospital where my child is does not have a children’s ward – can I still stay overnight? Even if your child is in an adult ward or hospital, they still have the right to have their parent or carer with them. Most nursing teams will do their best to allow you to stay with your child (even if this means on a chair beside their bed). You should ask the nurse in charge about this as soon as possible. If they say they don’t know, ask to speak to a more senior person. If you are told it is not possible for you to stay overnight, remind them of the child’s rights described in the EACH Charter and Article 9 of the United National Convention on the Rights of the Child (UNCRC) (‘States Parties shall ensure that a child shall not be separated from his or her parents against their will‘) and ask to speak to someone in authority. However, despite all of the above, it may not be possible for you to stay overnight as this could depend on what other patients are staying in the adult ward. How can I help prepare my child for hospital? Hospichill – an app designed for children and young people to help reduce anxiety surrounding their hospital visit. Many services offer pre-admission visits. For example, oncology has a pre-admission visit service in Glasgow and Kirkcaldy. These can be arranged on request through the hospital. Ask if your local hospital can offer a health play specialist appointment or pre-admission visit to help your child know what to expect. Please ask Children’s Health Scotland for more information. What Matters to You programme is part of a person-centred care approach. Ask you child’s healthcare team, if they are using this approach or check #WMTY17 on twitter, and to find out more about why it is important to ask what matters. How can I help if my child is in pain? How can I help my child to cope with needles? Every child is different. Some think having a needle put into them is the worst thing about medical treatment. However, whether for immunisation, a blood test or an injection, needles are something most children will have to face, so it is good to know how to help. The Children’s Health Scotland guide, Helping Children Cope with Needles gives useful information to the following questions. Is it normal for a child not to like needles? What should I say to my child about needles? When should I talk to my child? How does listening to my child help? How can healthcare staff help? What do we know about pain that can help? When should I start to prepare my child? What if my child cries while having the injection? How can I comfort my child? Is there anything my child can get to stop the pain? 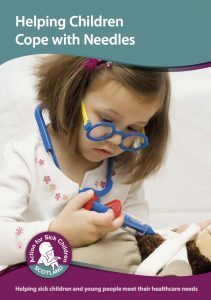 It also gives information on how to prepare your child, distraction and relaxation techniques, and lists helpful organisations. What can I expect from my GP service? The GP is often the first point of contact for parents/carers when a child they are looking after is ill. Children’s Health Scotland has produced a guide based on questions families have asked. How do I register my child with a GP? What should I look for in a GP? Can I change my GP? How can I get an immediate appointment for my child? How can I make best use of our consultation time? Can I refuse recommended treatment for my child if I think it’s unnecessary? Can I ask if my child can be referred to a specialist? Can I choose which specialist I want my child to see? Can I get advice over the phone? When is my child entitled to a home visit? What do I do when a GP surgery is closed? How do I cope in an emergency? What about GPs and confidentiality? Can I see what is written in my child’s GP records? If I am not the child’s natural parent, can I access their records? Will I be told if my child visits the GP on their own? Can my child give consent or refuse treatment? 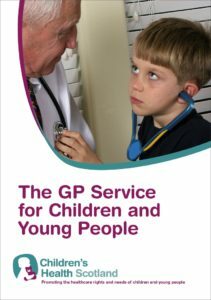 For answers to these read The GP Service for Children and Young People. I’ve registered with a new GP practice. What happens to my child's immunisation and medical records? When you register with a new GP your medical records will automatically be requested from your previous practice. This is carried out by NHS National Services Scotland Practitioner services. Once registered your medical records are requested and sent electronically to the new practice. Paper files usually take a month to arrive and longer transferring from NHS England or NHS Wales. Ireland and other countries do not usually forward paper files. Your medical records stay with Practitioner services until a request is received by the new GP practice. Your new GP will contact Practitioner services for help if your records are delayed. In the event of missing records or information, a GP will contact the relevant NHS Scotland health board or NHS Trust in England or Wales to speak to child health staff. If there are gaps in the child health records your new GP will ask you and your child questions about illnesses, immunisations, medical conditions, allergies, operations or injuries. The GP may also ask a practice nurse to complete a health assessment with your child. My child does not have a GP; what do I do? You could also contact the Practitioner Services Department of the NHS National Services Scotland at www.psd.scot.nhs.uk which must help you find a GP. Can I get help to speak to my child's GP or other NHS staff? Can I get information in different formats? You should be offered an interpreter, including BSL (British Sign language) and get information in translated and other formats to ensure you understand the information you and your child need to make decisions about your child’s health. You will not be charged for this service. If you need this facility please ask them, they are happy to help. NHS inform nhs24.scot or by calling 0800 22 44 88 Please let them know you need an interpreter. My child has been admitted as an emergency – I have nothing with me and no money. What can I do? All the main children’s hospitals have family support services who can offer advice and signposting when families have questions and issues. This can range from signposting to finance and travel arrangements to providing clothing and toiletries in an emergency admission or simply a place to sit quietly and a listening ear. 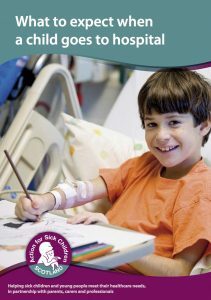 Examples include Family Support and Information Service (FSIS) in the Royal Hospital for Children in Glasgow, the Edinburgh Children’s Hospital Charity (ECHC) (formerly Sick Kids Friends Foundation) at The Royal Hospital for Children and Young People, Edinburgh (RHCYP) and Parent-to-Parent in Ninewells, NHS Tayside and Archie in the Royal Aberdeen Children’s Hospital. Do you have a patient information/support service? Who can I speak to when I need help with……? I am spending a lot of money on travel taking my child to hospital for treatment/appointments. Can I get these costs reimbursed? your child’s doctor refers your child for treatment in a different health board. In such cases your home health board should pay for the travel costs. You cannot claim travel expenses for visiting your child in hospital. Please ask at your clinic or hospital if you can claim travel expenses. Who do I need to speak to about claiming travel expenses? Liaison nurses or ward or clinic staff can answer questions about travel expenses. Ask them if there is a Family Support Service, hospital travel centre or Financial Inclusion Team in the hospital. If there is a Family Support Service in the hospital, they are your first port of call. They will have an office where you can go to claim back travel expenses. For example, the Safe Haven at the Royal Hospital for Children Edinburgh handles patient expenses incurred as a result of travel to receive treatment. If there is no Family Support Service, ask at reception who to contact or if your child has been admitted, ask the person in charge on the ward. What if my child is referred to a hospital far from home or in England? Sometimes children need to travel far from home for their treatment. This can be to a neighbouring health board or as far away as England or Europe. Your child’s team should make the arrangements and organise for the costs to be met so that you are not out of pocket. You can ask for help from your local finance office, specialist liaison nurse for your child’s condition or family support service. This page explains your rights and includes information about travel outwith the health board and to Europe. Can both parents receive help with travel costs? The NHS usually only pays for travel costs for one parent. If both parents want to or need to be there, you may have to meet the costs of one parent yourself. However, make sure to ask, as there can sometimes be exceptions where both parents’ travel costs are paid. Sometimes families may be experiencing financial hardship and need support and advice. Some hospitals (for example the Royal Hospital for Children Glasgow and Ninewells Children’s Hospital in Tayside) have a Financial Inclusion Team or Income Maximisers to help with this. Ask where to go in the hospital for financial support services and to find out about maximising income and checking benefits. You and your child may be entitled to certain benefits that you did not know about. It is always worth asking about it. My child has very complex healthcare needs. There are a lot of people involved in his care. How can I be sure they all know what is happening and who is in charge? Children and young people with complex healthcare needs should have a lead professional. You should find out who this is. It is usually the clinician – the hospital or community paediatrician. Complex Needs Coordinators/Sisters and Community Children’s Nursing Teams are very important and the Scottish Government’s Getting it Right for Every Child (GIRFEC) approach is essential. The National Clinical Network for Children with Exceptional Healthcare Needs (CEN) provides more information for families and practitioners on complex healthcare needs. Children’s Health Scotland is here to help. We have an experienced team with multi-disciplinary backgrounds. Whatever your question, large or small, we will give you an answer. It may not be immediate and we may have to do some detective work and ask other people but we will always get back to you. My child is going into hospital and may be there for some time. What will happen to their education? There is Scottish Government Guidance which sets out a child’s rights to education when they are in hospital or ill at home unable to attend school. If your child is going to be in hospital for 5 days or longer they should get education. Children’s hospitals have a hospital education service. This is sometimes called the hospital teaching service (HOTS). Some children’s wards in other hospitals (that are not dedicated children’s hospitals) might also have access to a teacher. However, even in an adult hospital, your child has the right to education. If staff at the hospital do not know how to get teaching support, please ask at your child’s school or local authority. If your child is recovering at home, they also need to get education support. Your child’s school will help to arrange this. Please find out more from the Enquire Factsheet 17: When a child can’t go to school. My child has been in a hospital with no hospital teaching services for over a week. What can I do? If your child is in primary school contact the head teacher of the school. If your child is in secondary school contact one of the guidance teachers or pupil support teachers. The local authority is responsible for education provision so you need to contact your child’s school to make arrangements. How can I prepare my child for dental treatment? Children and young people cope better emotionally with medical and dental treatment if they know what to expect; so you can help your child understand and prepare for dental procedures and treatments by using child-friendly language, toys, books and other resources, keeping in mind their age and level of understanding. You can tell your child what to expect. If your child needs dental treatment, ask what will be involved and share this information in a way your child will understand. Planning a special treat after the treatment will give them something to look forward to. Ask to visit the dentist’s surgery or the hospital before the treatment and allow your child to ask questions; they might have developed a fear from stories or television programmes that can be sorted out before they come for treatment. Be truthful if the treatment might hurt. You will risk losing your child’s trust if they are surprised or distressed. There are several good books available about visiting the dentist or going to the hospital. Your child’s school, playgroup, nursery or your local library can help you to find or borrow these. Help your child learn to take good care of their mouth and teeth. Try not to use a visit to the dentist or the fact that your child has to have teeth extracted as a punishment for not taking care of their teeth. This might give them a reason to fear the dentist. Be positive. Try not to promote anxiety by ‘passing on’ previous experiences with dental care. Dentistry and our understanding of how to care for our teeth have changed for the better. This information is also available as a leaflet (a Chinese version and an audio version are also available). When should I take my baby to visit the dentist? Take your baby with you to visit the dentist before they show their first tooth. This will help them to get used to visiting the dentist’s surgery, opening their mouth and will help them to develop trust as a normal part of their overall healthcare. Where can I get more information about my child’s dental treatment? 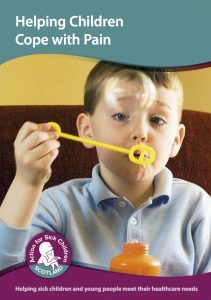 The Special Smiles Dental Play™ Project has developed resources specifically for children with physical disability, sensory or learning impairment. You can ask your GP, consultant or hospital unit for a second or further opinion (an opinion about your health condition from a different doctor). Although you don’t have a legal right to a second opinion, a healthcare professional will consider your circumstances and whether a second opinion is needed. You can find out more here. Do you have a question that's not answered here?